Enjoyholistic.com has an event system where users can search for events happening near them or by geographical location. Once events have passed their end date they will no longer be searchable. However, they can still be available within the “Past Events” panel on your profile, any groups or back-end dashboard. You can create an event using the “Create” button from the main menu. This will display a popup. Use the “+ ADD EVENT” to create your event. You will need to be a registered member. Signup it’s free and quick to do so. 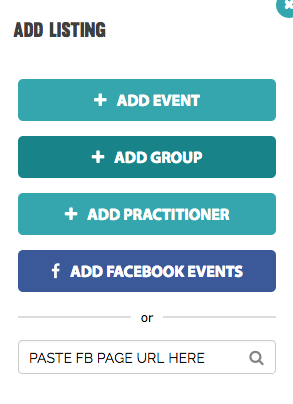 You can also import any existing events you have created on your Facebook profile or pages. To import a Facebook event then use the “Add Facebook Events” button on the popup. As per the image above. 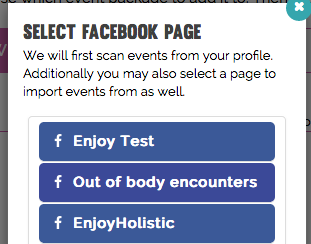 You will then be prompted to choose a Facebook page if you have one to scan for any events. If you have no events on any Facebook pages then simply press “Skip” to ignore. The process will then continue and check for any published events on your profile. If you have any available published events then a list will appear showing each event. Then in order to import an event use the “Import Event” button on the event you wish to import. Once clicked you will be prompted to choose a package for your event. You an choose to add it as a free event or pay for wider coverage and get more exposure across the site and within our many newsletters.